Once upon a time I would watch runners from my car and despise them. I know pastor’s wives aren’t supposed to despise others but I’m working on this. I promise. Little by little. I am human and God is working on me. This feeling of yuckiness when I sighted a runner on the road was unsettling and only began to happen as I approached my thirties, before then I don’t think I ever noticed runners on the road at all. But back when I was approaching dirty thirty with three baby boys strapped into their carseats in the back of my minivan, I started to see runners everywhere and I did in fact, despise them. I knew many people training for half marathons, running 5Ks and jogging just for fun. I heard their stories and felt something deep down inside of me, which I believed was disgust too but now I recognize was envy. What I was feeling was discontentment in myself and envy. I was envious of what the runners I knew and the runners I saw were able to accomplish, listening intently to their training plans and then in awe of how one could run for two hours straight. envy: a feeling of discontented or resentful longing aroused by someone else’s possessions, qualities, or luck. I then recognized the intense feelings I had about the runners along the road wasn’t actually disgust either. Overtime, I recognized the yucky feeling for what it really was: resentment, discontentment and envy. These feelings weren’t about those runners at all. The feelings were about me and something stirring in my heart. And overtime, as I saw the runners all over the streets in my town, as I thought about them and as I laid awake at night in my bed, contemplating my own training plans, I found calling. I found longing. I envied the road runners too and I wanted to be like them. Running was all around me and I was longing to give it a try. I could have continued to sit in my car and watch runners with my calling and longing, crippling me deep down inside or I could do something about that feeling of envy and join them on the road. That once upon a time was three and a half years ago. Five pairs of running shoes, almost three half-marathons (I am five days away from God-willing, crossing the finish line of my third 13.1) and one pair of knee high compression socks later. This is a short story about how I found myself on the trail. Not in a Cheryl Strayed kind of way, maybe a distant cousin of a Cheryl Strayed kind of way. My trail is an asphalt one, void of hills, packed with people on Saturday mornings, only miles from my car, with spectacular LTE coverage and I have only seen one house cat, a handful of deer and quite a few squirrels. All of whom wanted nothing to do with me, though all of them, when I saw their movement along the landscape to my left or along the river to my right, they all did give me quite a fright. And the closest I can get to Cheryl Strayed’s Monster, is a thin hydration belt which I clip around my waist. So I am not nearly as hard-core as Cheryl Strayed but I have found, along my trail that I am a whole lot more hard-core than I thought I was in the first place. My mother called me Flash during my SAY soccer days. This was something cute she had written on the back of my jersey. She used to say my long legs made me fast. All I recall was my long legs making me clumsy, a character trait of mine which I now embrace and love, but by the time I reached the sixth grade, when the girls started trash talking during scrimmages on the field, I ended up crying like a baby and my Flash jersey was retired forever. In eighth grade I cheated on the mile run around the track behind the middle school. I only ran three laps around the track instead of the full four. Other girls were lapping me and let’s be honest, I was dying. Cheating seemed better than death to me in that moment. In high school I waited to take PE until my final semester senior year. I didn’t want to humiliate myself by displaying my lack of athleticism in front of my peers so I put PE off until I could humiliate myself in a class where I was the only senior in a sea of freshman. That semester I let much younger kids whoop me in badminton and crab soccer, which may have been worse on the old ego than actually taking gym with my own peer group. To receive an A in PE and graduate with the GPA I wanted, I needed to run that mile in eight minutes and thirty seconds or less. At the time I was a seventeen-year-old, pack-a-day smoker. Cheating again crossed my mind on the day of the assesment but Mr. Kalugyer had eyes on me and was counting every lap, cheering me on. I almost hurled and passed out but I squeaked over the finish line that day at eight minutes and twenty something seconds. Most of the freshman probably lapped me that day but I can’t remember because I was literally sick when I finished that run. Ugh. Now I run three times a week, I haven’t smoked in over eleven years and I would kill to run a mile in eight minutes and twenty something seconds. Curse you metabolism. Exactly one year and one month after my third son was born, I suffered a miscarriage for the second time and in the wake of that grief is where I turned my envy and longing into action and decided to join those runners on the road. I had all of my three boys within three years of one another via cesareans and I had gestational diabetes with all of them. I shudder to think about what my BMI was back then but I started the slow journey of finding myself on the trail overweight, barely able to run a mile without stopping and with a background of smoking in my younger years with the cherry on top of cheating on the mile run in middle school. But I started to run. And I knew I wasn’t very good so I called myself, The Not So Runner Girl. In January of 2013 I began to train for my first half marathon. Some suggested I should start with a 5K but as someone who cooks thirty plus dinners at a time to hoard in her freezer, the whole idea of easing in and starting small just doesn’t make sense to me. I’ve kind of become a go big or go home kind of lady. I made it to six very slow run/walk miles that training season. Those six miles took me ninety minutes. Math people have already calculated that I was a FIFTEEN MINUTE mile in 2013. That sounds horrid to me now and I applaud the old not-so-runner-girl in me because it takes so much tenacity to trudge through a painful fifteen minute mile six times over. And I know some of you out there do this and I applaud you and encourage you to keep going. When nausea began to accompany those long runs during training season I discovered I was pregnant, which was not apart of my plan but with my miscarriage history, I hung up my running shoes that year and never made it to my desired race, The Flying Pig Half Marathon. With a heavy heart I grieved the loss of that race. I am pretty sure it poured that race day. I am actually certain it poured because I stayed home nauseous with our three boys and my husband ran the race instead, without any training at all. True story. Like salt in the wound. I ran a few times during my fourth pregnancy once I made it though my first trimester. I was certain I was carrying another boy but that summer I learned I was pregnant with my first daughter. I also passed my first glucose tolerance test that fall. The nurse told me she couldn’t be certain but she thought I passed because of all the running I had been doing which for the first time made me feel like what I was doing for my body actually mattered. When my daughter was four months old I began to train, again, for my first race. I would nurse my daughter in the mornings and head over to the park to meet my church’s women’s running group on Saturdays. I started at two miles and for the next almost six months I faithfully went through the Couch to Half Marathon Training Program. Nursing my infant all the way through it. I knew nothing about running and at times, I felt clueless. Cheryl Strayed talks about these moments on the trail, the times when she felt like a big fat idiot. That 2014 training season I was running two miles somewhere in between a twelve minute and thirteen minute mile pace. For a month I worked on building up to three miles to run my first 5K and I was dead set on crossing the finish line in under thirty-six minutes. And I did it. I finished that first race in 35:18 at a pace of 11:24. And five months postpartum after my fourth cesarean, this felt like an enormous accomplishment. I then trained for six weeks with a personal trainer, now friend, and she taught me about eating well, showed me how to properly squat and wrote down a bunch of exercises I could do from the comfort of my own home. I told her I wanted to break through the eleven minute pace that plagued me all summer and at the end of our training I had done it. I crossed the finish line of The Queen Bee Half Marathon in the fall of 2014. I had been injured almost right up to the race with terrible tendonitis in my ankle. I could barely walk when I saw my dear sorority sister two weeks before the race and she asked me, as close dear friends do, how I thought I could run thirteen miles when I could barely walk around Target. It truly was miraculous but my pain went away before the race and I even ran tape free. My finish time was 2:18:44. The first half of the race I ran at a 9:59 pace and the second half was a tad slower… see below. But my overall pace for that race was 10:36. Not to shabby for a not-so-runner girl. I fractured my metatarsal during the eighth or ninth mile of my first half marathon in true not-so-runner-girl fashion. I remember the very specific pain, but I had already been powering through what seemed to me to be much greater pain when I was running with tendonitis during the weeks leading up to the race, I thought running with pain was just part of it. I had no clue my foot was fractured until the bruise appeared two days later and I had trouble stepping on the lid release for my trash can with out feeling that pinpointing specific pain in my mid foot. 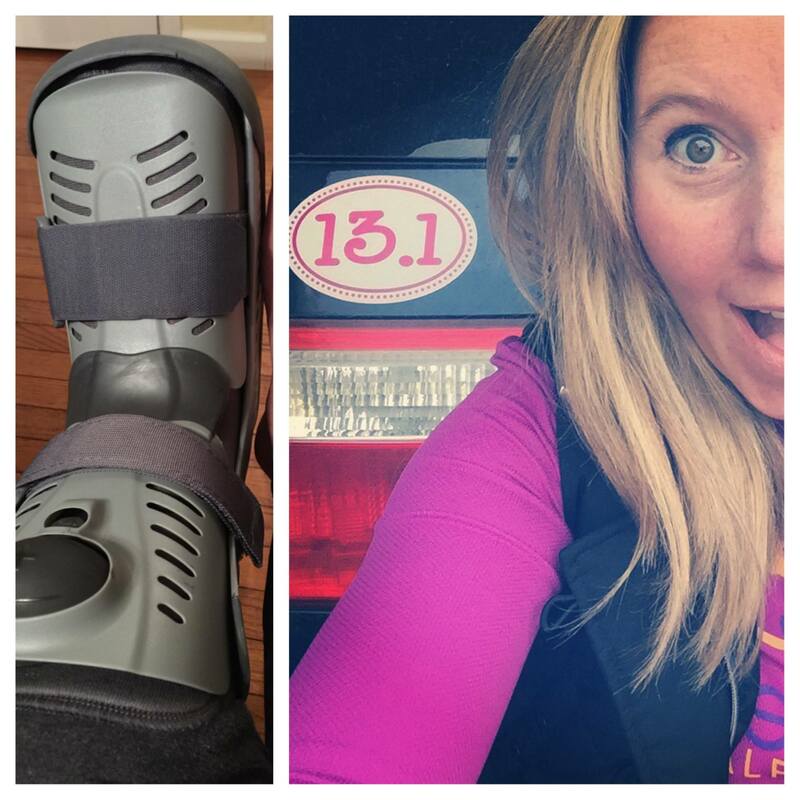 I was in a boot for six weeks but putting that thirteen point one sticker on my minivan was so worth it and my three boys thought I looked like Darth Vader in my boot so it was clearly a win for everyone. It was hard for me to come back after that. 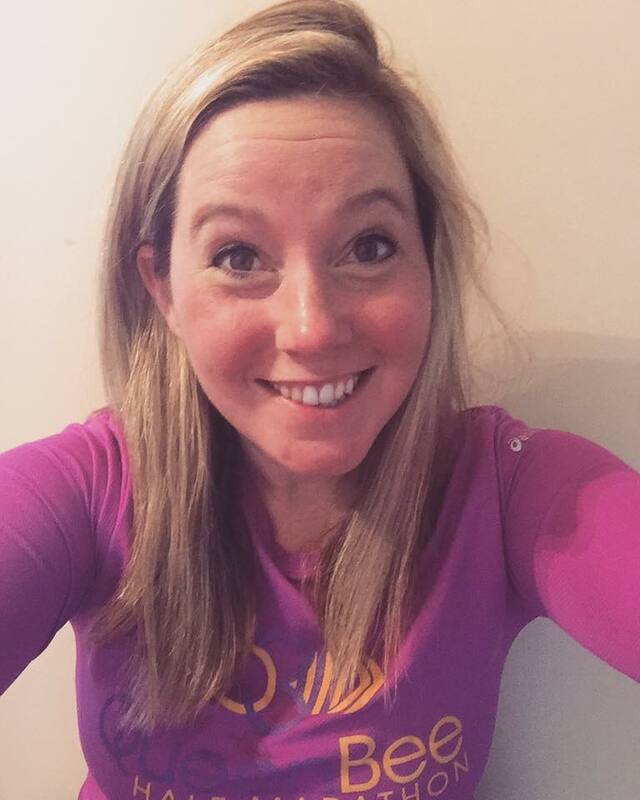 I ran a few times that winter but it was polar vortex cold and The Flying Pig Half in May was just not more precious to me than windburned cheeks or a frost bitten nose so I set my heart on training again that summer for The Queen Bee Half Repeat. I was stupid that summer. But not big fat idiot stupid. I was on the verge of feeling like a running diva. I had too much confidence and I was stupid. I didn’t follow a training plan and my go big or go home mentality teetered near insanity. I only ran distance runs that year. Once a week and accompanied by some spinning and body pump in the fall. My shin splints were relentless and when someone from our church saw me trotting around town on my ten mile run he said it took everything inside of him not to scoop me up into his car and drive me home. I recall him using the words, it was painful to watch you. I also got bronchitis the week before the race and the strong antibiotics my doctor put me on left me hurling over the toilet. I was a hot mess. Everything inside of me wanted to give up on that thirteen point one. But I had paid ninety dollars to do it so I dragged myself out of bed that morning and headed down to the race. I was even late. I didn’t even make it to my pacing group when they started the race, I barely made it to the walkers. I heaved myself over the finish line at 2:39:30. A 12:11 pace, my slowest race pace ever, shin splints screaming. I told myself after that race, that I would never, ever, ever run a half marathon again and decided if I came in a Not-So-Runner-Girl, I was retiring a Not-So-Runner-Girl as well. But then just two months later, I felt that longing again. The same longing I had felt before I started the journey. The longing to be on the road, putting one foot in front of the other. And not just a longing to run a half marathon but a longing to run a full twenty-six-point-two mile full marathon, a real deal race. Sometimes I wish my longings would pack up and leave me. Legitimate craziness lives in me. But this year, I have my heart set on running twenty-six-point-two and I think I have it in me to really do it. And I’m only half way there. In five days I will run The Flying Pig Half Marathon for the first time. The race that started it all three years ago. And then I will go on from there to train, God-willing, for the United States Air Force Full Marathon in Dayton in mid-September. My last four months of training have been a hot mess, just the same as the training seasons which have come before them. I was in a boot with a stress fracture for most February and some of March (only about five people knew about this) and then bronchitis struck me again, which is how I discovered I now have something called, running induced asthma. In addition to now toting an inhaler around with me when I exercise, my doctor suggested changing my diet, nothing cold to eat or drink and no dairy. For the first time in my life I have a fridge full of almond milk, I didn’t even know almonds could be milked but I purchased a three pack at Costco, so indeed, I guess they can be. But with all the hot messes I’ve encountered leading up to this race, I somehow feel stronger. Now a little bit closer to my mid-thirties I know I am stronger than I was three years ago and I’m certainly stronger than I was in my twenties. My twenty-year-old self would have quit in the face of adversity and I haven’t. I haven’t quit. Now, I even long to be out on the trail on Saturdays. I will trade my second cup of coffee with almond milk for it. To feel the morning sun peeking through the canopy of leaves above me and see it’s beauty as it reflects off of the brooks which trickle beneath me. Waving to other runners and hollering out Good Job, singing Dave Matthews lyrics terribly when I can’t see someone within ear shot, and reflecting on how far my determination and hard work has brought me. I’m a different woman than the one I was when I started the journey. And all I had to do to was be faithful to put one foot in front of the other. Part of me even feels the Not-So-Runner-Girl chapter coming to a close. Even though I began the journey a Not-So-Runner-Girl, I don’t believe this running story is over for me yet. I really can run now. I know about hydration belts, compression socks, how many GU packets I can fit in the pocket of my hydration belt, how to breathe in through the nose and out through the mouth, how to just push for one more mile. I’m not faster but I’m different. With each run and each mile I find myself saying, thank you for the miles, and thank you for showing me I am so much stronger than I believed I was. I get weepy just thinking about it. I’ve shut up the voices which sometimes remind me I used to be a girl who cheated on the mile run and I used to neglect my lungs and my health in my so called glory days. I have pushed the boundaries of what I thought I could do on that trail every week. I have pushed the boundaries of who I thought I was. Maybe my mom would be calling me Flash if she was still here. I know she’d be cheering me on. Cheryl Strayed writes about this turning point I am feeling so beautifully at the end of the fourth part of her book, Wild. “I cried and I cried and I cried. I wasn’t crying because I was happy. I wasn’t crying because I was sad. I wasn’t crying because of my mother or my father or Paul. I was crying because I was full. Of those fifty-some hard days on the trail and the 9,760 days that had come before them too. And as I walk into this third half marathon of mine, I feel healthy, and ready. And I feel tears. It’s so emotional to do something you never thought you could really do. I too am not crying because of happiness or sadness, but I am crying because I feel full. I have really done something, I am truly different. I’m no longer a Not-So-Runner-Girl. I feel her slipping away. I’m leaving her and entering into something else. Walking into this race I feel the exact same way as Cheryl Strayed because of a different journey on a much different trail. Fierce, humble and gathered up inside. I am thankful for every mile and every single person who has encouraged me along the way. 2016 will be a year of running in memory of my mother, Shelley Cronin. In 1998 when I was fourteen years old my mother lost her battle to breast cancer at the age of forty-one. Now at the age of thirty-three, married and with four kids of my own I feel like I desperately need to do something in my mother’s memory. Every day as I parent my three sons and only daughter is another day I feel the emptiness of her not being here. The missing of her seems to get worse the deeper I find myself in the trenches of motherhood. For the last three years I have been training for and running half marathons. I have trained for three and crossed the finish line at three. I am not a fast runner, I’m someone you will see trotting alongside the road and wonder if you should scoop me up in your car and drive me back home, cover me in ice packs and tell me to never commit that type of horror again. This year, I am running for a cause and because I am not a very good runner it will take me all year long. I am calling the campaign, Strides for Shelley. My goals are to run two marathon races: The Flying Pig Half Marathon in May (completed) and The Air Force Full Marathon on September 17, 2016. I have no idea if I can run 26.2 miles in my own strength and effort but I know with your support, your prayers and the great motivation of Strides for Shelley, anything is possible. After the Air Force Full Marathon on September 17,2016 I will be culminating this journey at the Cincinnati Race For The Cure on September 24, 2016, an emotional race for sure. I have set up my fundraising page through Susan G. Komens’ Race for the Cure site so all donations will now go directly to my local Susan G. Komen Chapter. If you’d like to join me, train with me, or start your own team please contact me. It would be a great honor to see so many others make Strides for Shelley too. You can train alongside me near or far. So this is it. A normal mom, wife, woman trying to make a difference and dream big in memory of someone I love and miss dearly in 2016. Will you help me make Strides for Shelley?